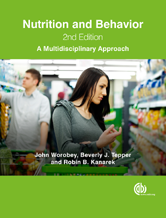 Editor/Author Worobey, J., Tepper, B. and Kanarek, R.
The relationship between nutrition and behaviour is bi-directional in nature, with nutritional factors able to affect activity and disposition, and behavior impacting diet and food intake. This book reviews these links, starting with their complex neurobiological basis, such as in the case of folate deficiency and cognitive decline. It also illustrates how behaviour may determine nutritional choices or status through peer modelling and poor dietary habits.